Armalite is going for the gold with its 3-Gun Series. The rifles are chambered in both .223/5.56 and .308/7.62. Competitive shooters look for any edge to shave time or group tighter. And ArmaLite intends to give this spirited group of gun enthusiast a leg up. 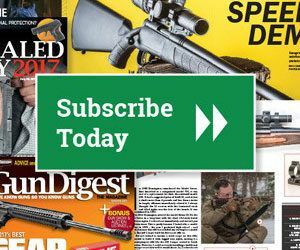 The Illinois-based company is now shipping its line of competitive rifles, which it bills as “ready to dominate… straight out of the box!” And from what the company has released about its 3-Gun Series, they appear to be loaded with a number of extras that should take first place with many sporting shooters. One of the more interesting aspects of the line is it is not purely made up of AR-15 style rifles. Along with models chambered in .223 Remington/5.56×45 NATO – dubbed the M-15 3-Gun – the company has also released AR-10 versions. The .308 Winchester/7.62x51mm NATO rifles – called the AR-10 3-Gun – could definitely find a place with match shooters looking for the superior long-range ballistics the larger caliber allots. Both of the calibers have options that help them conform to the style of competition they will be applied. Among the more notable features along these lines are the available barrel lengths. For those searching for a more maneuverable firearm, ready to tackle any 3-gun stage, there is a 13.5-inch barrel model. Those who require a more steady platform for high-powered rifle competition, there is a 18-inch barrel option. All of the rifles come outfitted with ArmaLite’s tunable muzzle break, allowing shooters find the sweet spot to reduce muzzle flip and directional recoil. In the case of the shorter-barreled models, the unit is pinned and welded to avoid the definition of short-barreled rifle – which would require a tax stamp. The rifles are outfitted with Luth-AR MBA-1 precision adjustable stocks that allow shooters to modify the firearms’ dimensions to theirs. The stock boasts both adjustable comb height and length of pull. Keeping with the adjustable theme of the rifles, the 3-Gun Series also comes with an adjustable gas block. The guns should also win fans among the trigger conscious with a factory-installed Timney Triggers that have a crisp 3-pound pull weight. The units are relatively light, the AR-10 models weighting in at 8.8 or 8.9 pounds depending on barrel, the AR-15s 6.6 to 7.8. Much of the weight savings comes from the from its KeyMod rail, which have 2-inch MIL-STD 1913 base at the front for sights. The upper and lower receivers are both forged 7075-T6 aluminum. The AR-15 rifles ship with one 30-round PMAG, the AR-10 with one 25-round PMAG. The MSRP on both AR-15 models is $1,599 and AR-10 is $2,099. Weight: 3.5″ barrel – 6.6 lbs. ; 18″ barrel – 7.8 lbs. The Gun Digest Book of the Gun Digest Book of the AR-15 Digital Collection is a four-volume series of the ultimate AR-15 guides – Gun Digest Book of the AR-15, Volume I-IV. With this collection, you will learn all about the AR-15 parts and accessories necessary to customize your gun.